I had the Fitbit at 10,000 steps a day and my mileage goal at five miles a day. When I reach 10,000 steps the wristband flashes and vibrates to 'say' "congratulations for reaching your goal". I have to use the Fitbit App on my phone to determine when I have reached the five mile mark. All this week I have hit the 5 mile mark so I have raised the step goal to 12,000. If I start to feel I am struggling to make the goal and adding undue pressure to my day I can adjust it down later on. I am sure once the Florida heat returns I will adjust my steps down accordingly but for now, with this delightful Florida winter weather, I am happy to walk without drenching sweat oozing from every pore. Where I came from in New York today's temperature is seven degrees Fahrenheit with a wind chill of -14. No thank you. If I still lived up north I would never leave the house in the winter. How are you keeping warm today? The winter blues have not gotten to me yet. I put it down to my polar fleece pants and jacket that I have been wearing this year. We are having record setting cold up here in Canada. As long as we don't get any deep snow I think I can make it through without complaining. Walking suffers and every spring I feel like I am starting over with the walking. 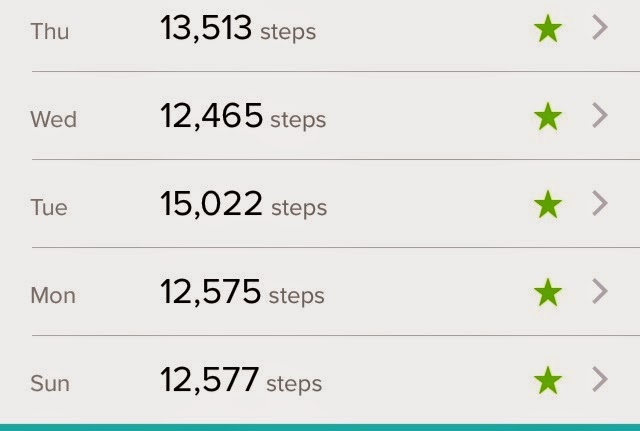 You're absolutely rocking the steps and mileage, Jane!! Oh, how I wish I was in Florida!!! It's freezing here--and this isn't near as cold as up North. I'd be out of my mind crazy up there!! I really like what you wrote about adjusting it down if you feel it's putting undue tension--i love it because, you're keeping your life streams and fundamental elements of recovery stream running parallel to one another--instead of crossing over and one disrupting the other. Nice, Jane!! Leg update please. Spent part of last week with a senior in high school who is in a leg cast (Mayo diagnosis after many months of trouble/misdiagnosis in her home town). So, I was thinking about you.